Supress end-survey for this presentation. Enable an end survey for this presentation. Are you sure? This will permanently delete this presentation. Warning: will disable previous passcode for all past participants. Go to your Presenter page link below to begin a presentation. You may add as many presentations as wished and may share them with other presenters as well. Tip: We suggest saving your presenter link as a favorite in your browser or place it in non-obvious page of your website for easy access. They simply click the link below and will instantly see the presentation you control from your Presenters' page. The link may be emailed to them in advance of the presentation but it is strongly recommended that the viewer's link be placed on your site in an obvious location with a description such as "Join Steve's Presentation" so that you can guide them to it in seconds at the beginning of your call so they can instantly join without need of email or other steps. Hover over any blue item to view the details. Maximum file size allowed for upload is 200MB. You may co-edit and share documents (Spreadsheets, Word, Powerpoints, Drawings) with others by associating GoPresent with your Google Docs account (Google does not charge a fee). No Google Docs account? Create One Free (then return here to activate it in GoPresent). You may sync GoPresent scheduler by associating GoPresent with your Google Calendar account (Google does not charge a fee). No Google Calendar account? Create One Free (then return here to activate it in GoPresent). May viewers bypass entering a passcode? "Before we begin, note that this system is interactive. Click anywhere on the slide right now, see the voting popup? Please click often to let me know what to expand upon or skip to save you time." Do not show this tip again. 1. To Start Screen Sharing. 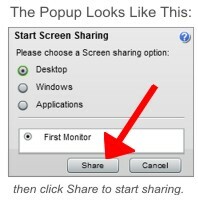 Simply confirm by clicking the popup "Share" button. The default option "Desktop" shares your entire screen (then open a new window to share a site, open an Excel or Word or anything you wish and the participants will see it). 2. To Stop Screen Sharing. Return to the GoPresent tab of your browser, then click the Screen Share button again (or click the "Next" slide button) to stop screen sharing. Please report any technical issues or suggestions on improving the system. Be SURE to include the exact steps from login to replicatethe issue, thank you. Busy on from to . Please choose slide to display for viewers and click [show] button. This will stop the screen sharing and show viewers just your slides, continue? This functionality requires to have installed Adobe Flash Player 10.1 or higher. Warning: GoPresent sharing is still on. Note: allow 10 minutes after recording for the link to work. Share Your: Sharing Active (to stop click the same button). PREVIEW MODE: To enable viewers to see this page click "show" link above. SHOW MODE: Your viewers can see the presentation below. SHOW A SITE MODE: Navigate below and viewers will see each new page. SHOW A SCREEN MODE: Choose Desktop, Application or Window to show viewers.